THE ROAD TO KHALISTAN: HAPPY INDEPENDENCE DAY! If you look carefully at the picture, you will see the bloody (literally) flag of India falling to the ground while the flag of Khalistan flies proudly over the erstwhile Indian Parliament Building. A smiling Sant ji is looking on. That is an independence worth celebrating!! And one day we will be celebrating for real, not just in an animation. 1. Isnt your fanaticism similar to Islamic fanaticism that is the biggest malady of the world today? 2.A state based on religion is what Jinnah wanted - look at Pakistan today. Do you really think states based solely on religion can be successful? 3. 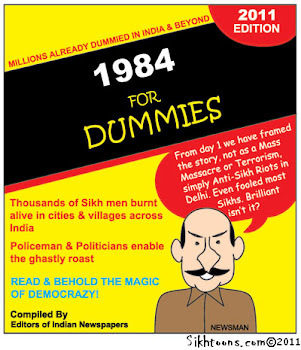 I do not support what Indira Gandhi did, in fact no one except her congressi sycophants support what happened in 1984. The anti-sikh riots were not hindu-sikh riots. It was government that was pissed after Mrs. Gandhi's death and the members of the congress who perpetrated the violence. Dont you think its wrong to absolutely disregard the feelings of most of the Hindus who love and respect Sikhism? 4. Dont you understand that we are a diverse but deeply inter-weaved fabric today. You cant separate people on the name of religion. There are Sikhs spread across the length and breadth of India. I belong to a small town from U.P. and there is huge sikh population there. We live with them and study with them. They own flourishing businesses. 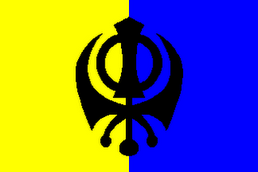 My brother studied in a Khalsa school. We group of friends comprising of Hindus and Sikhs regularly visit Gurudwaras and together we celebrate durga-puja, holi, diwali, lohri etc. - in fact the biggest collection for such poojas comes from Sikh families in our neighborhood. Dont you think you are following a too narrow minded view? You tend to believe Sikhism is only limited to Punjab. I am sorry to tell you, that is not the case. Get out and visit different cities of this country, you will find too many Sikh families living happily.How can you even think of uprooting them from their lands? How can you even think of snatching their livelihoods? There are so many marriages happening between Sikhs and Hindu-Punjabis or Jaats. How can you even think of separating people from their friends and families.This is sheer blasphemy. This separation is not what Guru Gobind Singh envisioned. 6. Hinduism is not a monolithic religion. In fact there is no religion as Hinduism. It does not prescribe anything - idol worship, casteism etc. are distorted forms of this ancient philosophy. All religions that have branched out of so called Hinduism have picked up a few philosophies and left a few bad practices. I really praise Buddhism/Sikhism/Jainism for this. But basic philosophy of all these religions is the same - There is one almighty God, one superpower, one source of energy in the universe. All souls are a part of that omnipresent energy. Body is a dress that the soul wears and sheds. We achieve Nirvana from this cycle of birth and death by means of good Karma. All these religions propagate tolerance and moderation. They are very different from Abrahamic religions which are orthodox and which claim that this Earth will be saved if everybody starts following Islam /Christianity - Rest others are labelled kafirs or pagans. The Indic religions do not have any such hate theory. Dont you think in light of all this, we should not make a big deal out of so called religious differences? 6. And my last question rather request to you is - This is an era of education and era of development. History has taught us well that religion has brought only inflicted pain on humanity. Millions of people have lost their lives on the name of religion. We, the younger generation, we do not want any of this non-sense anymore. We would prefer knowledge, innovation,equality, humanity and peace to prevail. We are tired of these separatist agendas !! Please stop it for God sake if you do not want more blood-shed.